35 Records Returned 10 Records Displayed. 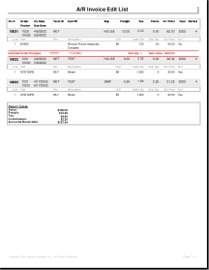 Description: Vista alert that notifies the user when entering an accounts payable invoice line that was purchased by Lot, and will display the PO Lot Charge from the Purchase Order. Description: Allows a Vista Administrator to restrict and maintain the users that may edit a Purchase Order once created. 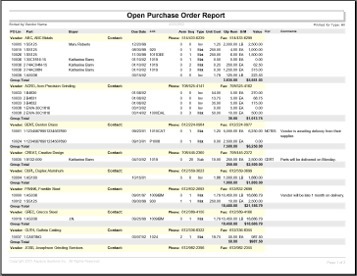 Description: This Vista Open Order Report contains customer, part and purchase order filters, and primary and secondary sort options by Customer ID, Customer Name, Delivery Date, Part ID, Purchase Order or Sales Order for a total of 30 available sort options! Description: Provides the ability to print multiple Vista shipping labels with the part ID and quantity per box for each shipping box. 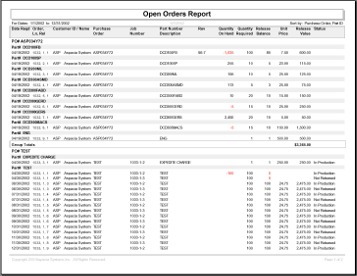 Description: Vista program that allows a quantity overshipped on an order release to roll forward to the remaining order releases.